I called all the children over to see. It’s okay to see death. Children needed to see, to ask questions, and to be there. It was up to me to guide the situation and open a discussion. First we looked at the fur and talked about how lucky we were to be up close and see how truly beautiful bunnies are. That was the beginning of the real discussion. We talked about old, and people dying when they’re old. We talked about what happens when we die, that we cannot come back again. Children talked about grandparents and great-grandparents, some of whom are sick. We talked about our dogs who died, Bailey, Finn, and Harry. Each had an important story that needed to be told, because children need to talk about death- the dreaded “D” word that many parents and teachers don’t want to face. Other children needed to listen. The bunny was close to our Memory Garden, so we walked over and read the names of class pets who had died, painted on rocks by the children. It doesn’t take a dead bunny on the playground to talk about death and dying. It can happen with a really good book. I know, because a few months later, I discovered The Rough Patch by Brian Lies. While there have been many children’s books over the years to address this subject, few have hit the heart with a golden arrow. The Rough Patch does just that. The book just received the Caldecott Honor Award. Yes, it’s that good. Evan’s best friend and beloved dog dies. In the most poignant writing when the dog dies, the author writes, “But one day, the unthinkable happened.” When I read those words to the children, they were silent and wide-eyed. Their faces showed worry. They needed to talk. And we did. We talked about our pets who died, and our grandparents who died – like we did when the bunny died. We talked about how that makes us feel, because Evan was angry. Children get angry, they get sad, too. They need to know it’s okay to feel that way. They need to talk. And that’s what we do with a good book. In The Rough Patch, the rich, brilliant illustrations complement the text (no wonder it won a Caldecott). There is a page in the book, perfectally illustrated, when Evan suddenly realizes what he has done to his garden after being angry. He has hacked it down, the one thing he and his dog enjoyed together. Evan’s eyes in the illustration speak many words. They seem to find a pathway to the heart, and open the door for children to speak, and ask questions, or get a hug. Death can make a child feel angry. Go and grab this book. It is a warm blanket. This entry was posted in behavior, Death and dying, Early Education, Expressing words and feelings, Nature, preschool, Teaching young children and tagged Death and dying, emergent curriculum, literacy, picture books, reading books to children, Teaching death and dying, teaching young children, The Rough Patch by Brian Lies. Bookmark the permalink. thank you so much for this book suggestion, like you, i’m always searching for a good one to use when this happens to my kinders and their families. You’re welcome, Beth. We really need books like this to read to our kids at school. My Part 2 will be another excellent book with a different emotional take, “City Dog, Country Frog” by Mo Willems. Thank you for your sensitive and beautifully written story and review. That book about killed me, Jennie. We read it last year and I had to walk away. The ending was so heartwarming though. Another one we read a few years ago called “Ida, Always” is another good one to help kids understand. It still made me cry though. A lovely post, Jennie and you dealt with it in the best possible way…when my first husband died my children were 5,7 and 9 and hard as it was we had to deal with it and talk about what happened ( he wasn’t) ill it just happened. But they came through it and we still talk about him and remember kids are tougher than we think and deal with death sometimes better than adults..
My goodness, Carol! I’m so sorry. My mother went through the same thing when we were very young, too. Perhaps that is the root of my feeling it is so important to address. And yes, kids are far more resilient than we give them credit for. We had a parent in school die last year after a brief illness. He loved Captain America, and now our Memory Garden at school includes a big rock painted with the Captain America symbol. It gives teachers and children plenty to talk about. Many thanks! You are an amazing human to understand how important that subject is for children. Thank you for sharing these stories. Jennie, this post is a very much needed subject to address with kids and thank you so much. You are the perfect teacher/person to address this sometimes very difficult subject for kids. When I hear parents, neighbors, or family friends say, “He/She has gone to a better place.” I find that statement is rarely or never a good thing to say, because small children take it to heart. There are better ways to talk about death to a child or even an adult and your example is exactly the perfect way to talk about death and loss. Thank you. Well said, Karen. And thank you. Children really don’t need long, fancy answers. They just need to know you will listen to their questions and answer as best you can, with heart. Statements that side-step death don’t help at all. Jennie, a teacher of young children, shows us a wonderful way to talk about death to children and most importantly, how to listen to children’s questions regarding death. Thank you, Jennie. Thank you, Jennie. I knew this book received the Caldecott award, but I wasn’t aware of the story. I’ve been asked many times about books to help children deal with death, so I’m happy to know about The Rough Patch. I’ll be checking it out this afternoon! Thank you, Susan. The illustrations are fabulous, as close to Kadir Nelson quality as I have seen in a while. I also love City Dog, Country Frog by Mo Willems, and will talk about that book in Part 2. I was ten when my dad died, and I can tell you that teaching understanding and coping is extremely important. Yes, children are afraid, but because their survival pattern is egocentric, they tend to blame themselves for circumstances they don’t understand or those that are out of their control. Having an understanding of life processes can avert deep wounds that may take a lifetime to heal. Well done Jennie. Beautifully said, John. I was five when my father died, and my Mother handled it very well with us. My older brother seems to have some wounds, as he felt some blame – it’s what children do in that egocentric survival pattern. Open conversations are like a vaccine for down the road. Thank you, John. I’m glad this made sense and resonated with you. That is always such a difficult topic, but children appreciate it when you don’t try to fool them and yet are empathetic and sensitive while being truthful. I always liked Leo Buscalia’s book “The Leaf” designed for explaining death to children. It is good they learn young. That is an excellent book, GP! We talk about flowers and leaves on the playground when they die. Yes, it’s good to learn young. What a great teacher you are to realize the poignant moment was also one rich with teaching and discussion. Those kids are lucky to have you. I have added The Rough Patch to my list of must buy books for my classroom and I look forward to sharing it with my third graders. Thank you! And please let me know what your third graders think of the book, as well as what they talked about. Beautifully, insightfuly done, Jennie. Hugs on the wing. We had many fish funerals when my daughter was little. We had a more elaborate funeral in the fall when her turtle died when my girl was 5. In the spring she and her neighborhood pals came in from the yard announcing “the turtle went to Heaven.” How did they know, I asked. “We dug it up and it’s gone!” Our dogs have similarly been ceremonially buried. My grandchildren when little loved to hear about the dogs they never knew and loved to see where they were buried. No discomfort from them at all. Benjamin was not quite 4 years old when his paternal Grandfather died suddenly just two weeks before Christmas in 2017. He had no experience with death previously in his life and his parents were unable to handle their own grief and his too. I fell back on a book that I had used when a friend of my eldest daughter had been tragically killed by her own school bus when they were in elementary school. “Lifetimes : The Beautiful Way to Explain Death to Children” by Brian Mellonie and Robert Ingpen was first published in 1983 and this wonderfully illustrated book is still an amazing tool for families (and teachers). Right after Grampy’s death, I came across the Chatter Blog by Colleen Brown that featured a Christmas Tree she had painted and stated that she would decorate this tree with ornaments with names as memorials for anyone that requested one. This led to discussion between us about his newly encountered loss. Benjamin and I asked for an ornament for Grampy Mark and when the tree was completed, Colleen gave us permission to print copies of the picture. The framed print is on his bedroom wall and another copy was given to his Grammy. Another thing that we did that year was have star-shaped porcelain ornaments with a photo of Benjamin and Grampy made to hang on his and another for Grammy’s tree. This was ceremoniously placed on his Christmas tree again this past year. The importance of talking with children about death and listening to them talk about their feelings about loss will have an impact upon their lives forever. It is up to adults to help guide them to an understanding and acceptance of an unavoidable truth. Death is part of living and must not be considered a taboo subject for children, that will only cause unnecessary fear. Well done Jennie! Thank-you! My goodness, Ellen! What a lovely, important, and deeply moving story. Hats off to you for guiding Benjamin through this sad and sudden death. I don’t know the book, but I will look it up. Many thanks for reading and your poignant comments. Brian’s book is indeed wonderful, nice wrap-up to the sad bunny post, and I agree death is important for children to be exposed to, unlike myself who feared the very idea of it (still do! ), due to lack of knowledge. Death is a hard subject, but it’s not one to shy away from. Well done, Jennie! I’m a little sad about the bunny. We have at least one in our yard, and we’ve been worried on these really cold nights. Thank you, Dan. 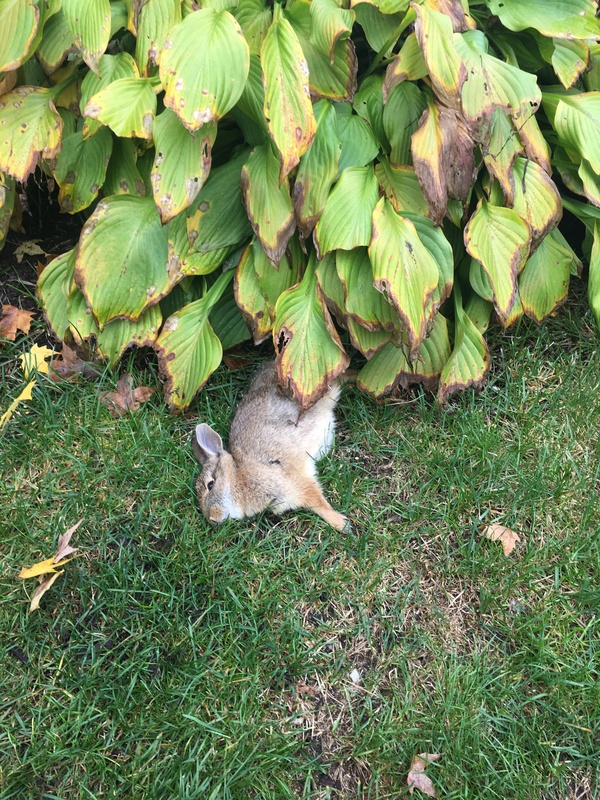 I thought about Sammy when I took the picture of the bunny. Jennie, thank you for this very important post! Excellent. Such a sensitive topic and you handled it with grace and aplomb (first time I e ever used that word and it fits perfectly). Nice job, Jennie. Thank you, Steve. Such a fancy word! You are such a pro, Jennie. There’s nothing quite like simple honesty. Thanks for the book recommendation. Thank you, Diana. Simple honesty is always best. You will love the book! This is such a wonderful piece of writing Jennie, and thank you so much for it, and Charles, for sharing it with all of us. Jennie is truly a magical person who has so many different ways to deal with things that come up in life for children. Thank you both once again. You are both so appreciated. Thank you for your very kind words, Anne! I remember when my youngest girl cousin was still 8-9, and her dad had terminal cancer. She was staying with me and my husband at the time so that her mother could visit her dad and be with him through the whole thing. I went to the library and told the librarian that I needed books and for her age that dealt with death. Then I took them home and read them to her. Her mom told me later that it helped her a lot. So I am a big believer in finding whatever tools we have, and trying to find ways to talk about it, for it is something that we all encounter in one way or another, often while we are young. This is another good way to help the children. I’m so glad you shared your story, Anne. It really reinforces all the good a conversation and a book can do. Thank you! This is a wonderful post, Jennie. Your children are so lucky to have a teacher as compassionate as you who is able to allow them to share their thoughts and feelings and discuss even the difficult subjects that are important to us all. Thank you very much, Norah! Jennie, death is a difficult topic and us adults find it hard to discuss this with our children. Your sensitive and calm nature, letting them ask questions, see for themselves is a lesson they will never forget. How true that it is not a question we like to face our children with but often there is no option. My son’s grandmother (my husband’s mother) passed away when he was only three …it was hard finding the balance of what to say. It is never easy, Annika. I embrace death with animals because it helps children down the road when it happens with a loved one. A good book really helps!! You have shared some real wisdom here, Jennie. You are right, children do need to understand death and that it is the next stage of life and not something to be feared. I have purchased this book. Thanks for the recommendation. Thank you, Robbie. It seems to happen when you least expect it. And not talking about it often causes fear. Having a good book on hand certainly helps. Let me know what you think of the book. Jennie this an excellent share. As adults, we miss this reasoning. The stage of childhood is perfect for coming to terms on life exiting. So glad you were one to “do the opposite”! Death is a community experience…the community looses a member… We are not meant to process the aftermath alone! My husband, a teacher did a post on NealEnjoy.com dealing with children and death. I was glad to see this post. A lovely and important post, Jennie! You’re spot on, children need to learn about death as well as life. It’s simply wrong to try and ignore it or hope someone else will teach them about it. You did just right by letting all the children come, look and talk about the bunny and their own experiences. Bravo! You’re one awesome teacher!